It's All About Home With Jo Rae » What’s Age Got To Do With It? Much like the introductions in an AA meeting, Robin McGraw—wife of the ubiquitous Dr. Phil—is fifty-five and refreshingly honest about it. 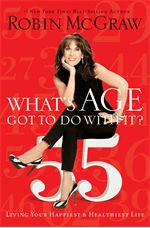 In her newest book, What’s Age Got To Do With It readers are rewarded with a total body makeover via Robin’s experience and field of experts’ advice. You can’t help but like McGraw, her sincerity seeps through the pores of the pages. After losing her mother to a massive heart attack, McGraw stepped onto her vanity stool to share the message we needed to hear—taking care of yourself should be your first priority. Not doing so can (as in the case of her mother) be the death of you. Professionals in nutrition, skin care, compound pharmaceuticals, gynecology, alternative internal medicine, psychology, makeup, fashion, and hair color are quoted in this beauty bible. Chapters include Robin’s recipes for better health and beauty, called Robin’s Rx, as well as a question- and-answer section from her collection of experts. Although I found this book entertaining, I felt it lacked depth. The book’s chapter on hormones fell short in providing information for a major sector of women, women in surgical menopause. McGraw’s endorsement of bio-identical hormone replacement, however, was a timely one and falls on the high heels of the national media’s attention to the subject. She combats the notion that the change from babe to banshee is an inevitable one. Robin asserts natural hormone replacement, and sleeping naked, can leave the pharmaceutical companies sweating alone. The chapter on Faith, at just 4 ½ pages, read like an afterthought. I would have enjoyed reading how McGraw’s relationship with Christ was shared with those in her makeover chair. After all, a life with Him is truly age defying, it’s eternal. What’s Age Got To Do With It blows out the myth that the number of candles on your cake could mean you’re old. But don’t eat the cake. Robin says sugar causes wrinkles.